My first visit to England filled us with surprisingly delicious pub food and admiration for spectacular medieval architecture. 13 days of mostly rainy weather didn’t slow our hike of 112 miles across “England Coast to Coast” which I photographed on commission for Wilderness Travel, 2017 July 23–August 5. Starting by dipping our boots in the Irish Sea, we cut a swath across England’s historic and literary landscape, over the fells of the Lake District to the pastoral beauty of the Yorkshire Dales and North York Moors National Parks, to Robin Hood’s Bay on the North Sea. Afterwards, we enjoyed guiding ourselves through York, castles and abbeys in northern England (further below), plus Scotland (in separate article). Inquire about purchasing any of the above images using my Portfolio site. 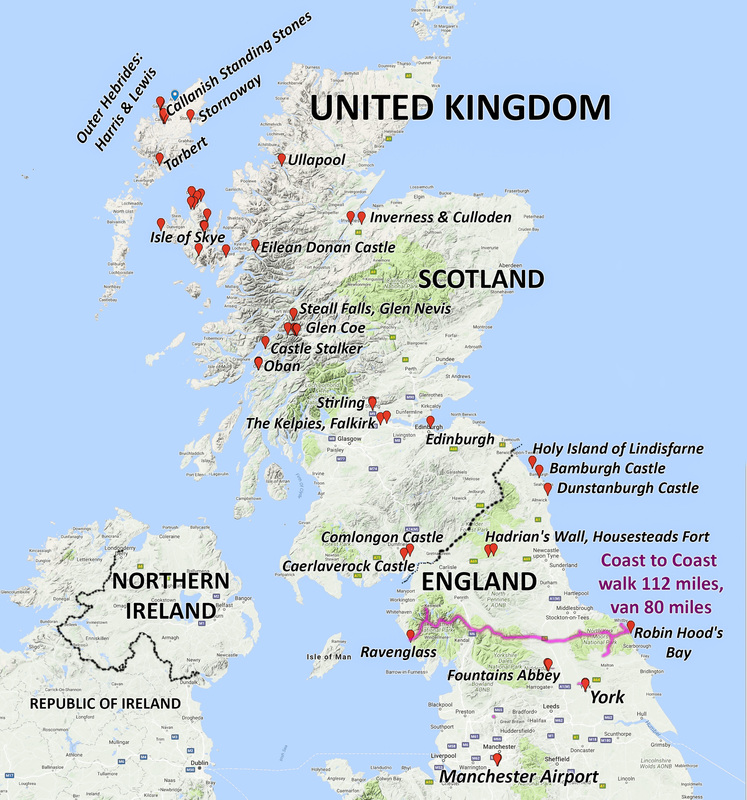 Map of our sights in northern England and Scotland, in the United Kingdom, for 34 days round trip from Seattle to Manchester 2017 July 23–August 22. The historic walled city of York lies at the confluence of rivers Ouse and Foss in North Yorkshire, England. York is renowned for its exquisite architecture, tangle of quaint cobbled streets (called the Shambles), iconic York Minster, the longest medieval town walls in England, and a wealth of visitor attractions. Founded by the Romans as Eboracum in AD 71, it became capital of the Roman province of Britannia Inferior, and later of the kingdoms of Northumbria and Jorvik (mostly controlled by Vikings 875 to 954). In the Middle Ages, York grew as a major wool trading center. In the 1800s, York became a hub of the railway network and center for confectionery manufacturing. The University of York, health services, and tourism have become major employers. York Minster, built over 250 years 1220-1472 AD, is one of the finest medieval buildings in Europe. Also known as St Peter’s, its full name is “Cathedral and Metropolitical Church of St Peter in York.” York Minster is the seat of the Archbishop of York, the second-highest office of the Church of England. “Minster” refers to churches established in the Anglo-Saxon period as missionary teaching churches, and now serves as an honorific. As the center of the Church in the North, York Minster has played an important role in great national affairs, such as during the Reformation and Civil War. Renting a car one way from York to Manchester (our entry & exit airport) for 2 weeks allowed us to easily see the following sights in Northern England on our way to and from 12 days in Scotland. We rented a peppy Vauxhall Astra hatchback car with automatic transmission from AutoEurope.com for just US$33 per day (plus gas $6 per gallon, at 50+ mpg) and quickly learned to drive on the left through hundreds of efficient roundabouts. The United Kingdom still indicates miles and MPH on road signs, but metric for most everything else. Fountains Abbey is one of the largest and best preserved ruined Cistercian monasteries in England. Visit it near Ripon and Aldfield, in North Yorkshire. The adjacent Studley Royal Park features striking 1700s landscaping, gardens and canal. Founded in 1132, the abbey operated for 407 years becoming one of the wealthiest monasteries in England until its dissolution in 1539 under the order of Henry VIII. Studley Royal Park including the Ruins of Fountains Abbey is honored as a UNESCO World Heritage Site. Walk 3 miles round trip from Craster village to the impressive ruins of 1300s Dunstanburgh Castle on the coast of Northumberland. The castle was built by Earl Thomas of Lancaster between 1313-1322 on existing earthworks of an Iron Age fort. Thomas was a short-lived leader of a baronial faction opposed to King Edward II. This strategic northern stronghold never recovered from seiges during the Wars of the Roses 1455-1487 after it changed hands several times between rival Lancastrian and Yorkist factions. King James I sold the fort into private owndership in 1604. Dunstanburgh Castle is now owned by the National Trust and run by English Heritage. The site of Bamburgh Castle was originally a Celtic Brittonic fort known as Din Guarie, possibly the capital of the kingdom of Bernicia from its foundation circa AD 420-547. After passing between Britons and Anglo-Saxons three times, Anglo-Saxons gained control in 590, but it was destroyed by Vikings in 993. The Normans later built a new castle here, forming the core of the present one. After a revolt in 1095 (supported by the castle’s owner), it became the property of the English monarch. 1600s financial difficulties led to its deterioration. Various owners restored it from the 1700s-1800s, ending with complete restoration by Victorian era industrialist William Armstrong. Today, the Armstrong family owners keep Bamburgh Castle open to the public. It was a film location for “Robin Hood” (2010) directed by Ridley Scott. Holy Island history dates from the 500s AD as an important center of Celtic Christianity under Saints Aidan of Lindisfarne, Cuthbert, Eadfrith of Lindisfarne, and Eadberht of Lindisfarne. After Viking invasions and the Norman conquest of England, a priory was reestablished. A small castle was built on Holy Island in 1550. Hadrian’s Wall (Latin: Vallum Aelium) at Steel Rigg, England, United Kingdom, Europe. As the Roman Empire’s largest artifact, Hadrian’s Wall runs 117.5 kilometers (73.0 miles) across northern England, from the banks of River Tyne near the North Sea to Solway Firth on the Irish Sea. Much of the wall still stands and can be walked along the adjoining Hadrian’s Wall Path. Within the Roman province of Britannia, it defended the northwest frontier of the Roman Empire for nearly 300 years. It was built by the Roman army on the orders of the emperor Hadrian in the 6 years following his visit to Britain in AD 122. From north side to south, the wall comprised a ditch, stone wall, military way and vallum (another ditch with adjoining mounds). The wall featured milecastles with two turrets in between and a fort about every five Roman miles. Hadrian’s Wall is honored as a World Heritage Site. The wall lies entirely within England, and is unrelated to the Scottish border, which lies north of the wall at distances varying from 1-109 kilometers (0.6–68 miles) away.